The TSA (Transportation and Security Adminstration, or, as I’ve heard them described in the wake of their ‘enhanced patdown’ policy, the Testicle Searchers of America) just keep getting hammered by reports of untoward, unprofessional and downright illegal behaviour on the part of its staff. In the past couple weeks, I’ve read a number of stories describing questionable searches, humiliating patdowns (one leaving a cancer survivor with a urostomy bag soaked in his own urine), and, most recently, this story about a security consultant being detained (illegally, from the sounds of it) for taking pictures. There is certainly something to this argument. 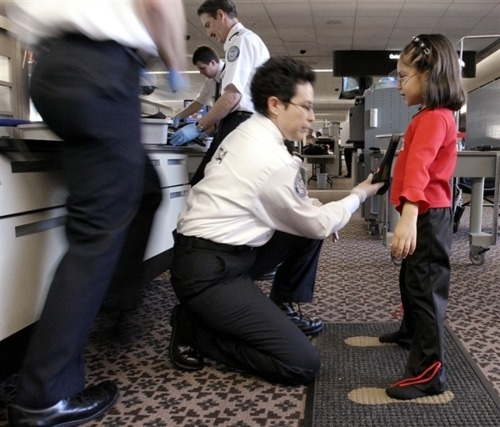 Like other quasi-law-enforcement professions, employment with the TSA is likely appealing to those who are high in social dominance orientation (SDO). As the TSA’s reputation for gestapo tactics increases, the effect on who’s attracted to employment there and who sticks around will probably be enhanced. But the TSA’s employees aren’t all power-hungry, dim-witted junk-gropers. In fact, I’m willing to guess that many of the atrocious abuses described in the press were carried out (or at least passively observed) by perfectly lovely folks who (outside of work) you’d have no reservations about inviting to dinner. Last time my partner and I flew through LAX, for instance, our carry-ons were screened by a wonderfully good-natured TSAer, who chatted and joked with us as he did his job. So why does the TSA fail so spectacularly? Here’s my speculation about one of the causes. I will start with the indefensible position: TSA agents aren’t given enough discretion. I can hear you already: ”But they have too much leeway already! They ride roughshod over travellers on a whim!” But what I’m arguing is that TSA agents seem to lack meaningful latitude in how they pursue the TSA’s aims (I’ll get to the abusive kind of leeway in a bit). Consider how almost all of these Nightmare At The Metal Detector stories end: With a phalanx of TSA middle managers all phoning their boss, and their boss’ boss, looking for an answer about what to do. TSA agents have all the wrong kinds of latitude. They lack the ability to exercise discretion when it counts. They lack the ability to use their judgment about how to balance their security aims with efficiency, compassion and other criteria. They act like people who care more about adhering to policy than accomplishing anything of substance. Researchers showed more than thirty years ago that this kind of low decision latitude is a source of work strain. Particularly in the lower rungs of an organization, one of the ways people protect themselves from such strain is through depersonalization — being cold, detached, callous or indifferent to those you encounter in the course of the job. Follow that? Low job latitude, strain, depersonalization. In other words, if you place people in a job where they have little meaningful autonomy, they tend to burn out, and when they burn out, they use the little autonomy they do have to act as petty tyrants, treating people without dignity and compassion. This all gets entrenched and reified, as I described above, as people who dislike this environment select themselves out, and those who find it appealing (the zealots, the power-hungry and the excessively handsy) are drawn in to the agency. First, you create the assholes. Then, the assholes are drawn to you.